UPDATE Dec 16th: Access to the Fromme Parking lot is now open to vehicles but will be limited to single lane traffic. We have been advised by the District of North Vancouver that access to the parking lot on Mountain Highway is now closed to vehicle traffic. Users can still access the are by walking or walking their bikes through the construction zone. We will update the community once access is reopened. 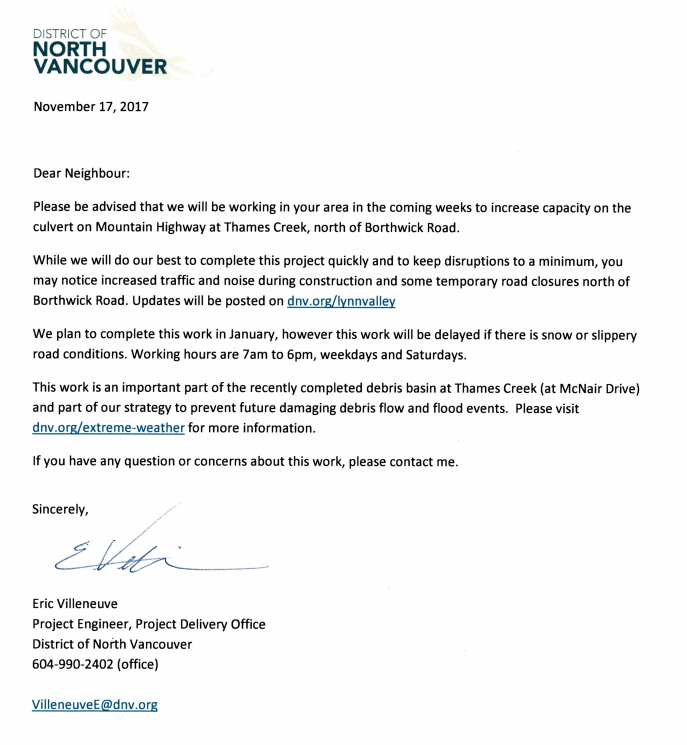 The District will be adding a culvert across Mtn Highway (at Thames Creek), about 50 yards past the Fromme gate. A contractor will be working through December into January. During this time, they will need to completely close the road for approximately 5 weekdays. At this point, which 5 days still needs to be determined – weather is the main factor. This means that the parking lot will be inaccessible during this time. Contractors have agreed, however, to keep a path for bikes and pedestrians open through the construction site. It is recommended that bikes dismount for this short section.